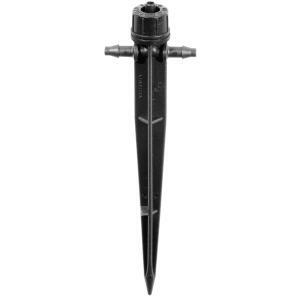 The CETA 1 GPH Pressure Compensating Dripper on a 5" Spike is a pressure compensating emitter with turbulent flow to reduce clogging. It has a 0.16" spout and pre-set discharge rates designed for inlet pressures of 15 to 25 PSI. Use with pots, planter boxes, balcony, patio, and landscape applications.